"Thus, beyond all questions of quantity there lie questions of pattern, which are essential for the understanding of Nature." "The world is full of things for which one's understanding, i.e., one's ability to predict what will happen in an experiment, is degraded by taking the system apart, including most delightfully the standard model of elementary particles itself." 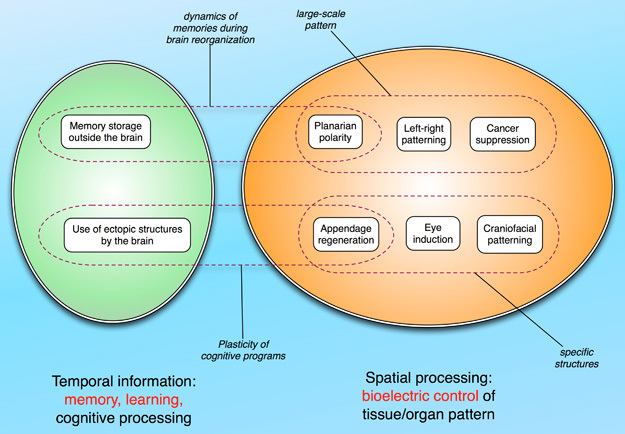 Biological information comes in (at least) 2 flavors: spatial information (3-dimensional structure or topology of tissues, organs, and whole organisms), and temporal information (perceived patterns within environmental stimuli that occur in time). Both of these kinds of information need to be detected, remembered, and processed by cells and tissues to guide their function. Our lab uses a convergence of molecular biophysics and computational modeling to understand how this occurs at multiple levels of organization. The results of this effort will not only shed light on the fundamental nature of real living creatures but also will provide important clues to the capabilities of "life-as-it-could-be" in synthetic biology or hybrid cybernetic systems. The former ties our work to the biomedicine of birth defects, traumatic injury, and cancer. The latter has implications for the design of artificial life and the engineering of robust, adaptive devices and novel computational media. Altogether, we view this as a branch of information or computer science as much as it is biology.